Did we kill the Great Barrier Reef? An alarming new study has come to a depressing conclusion about the Great Barrier Reef. Did humans kill the Great Barrier Reef, one of the greatest natural features on the entire planet? Well, no — at least not yet. But things are getting pretty dire for this natural wonder, and mankind is running out of time to do something about it. The media frenzy over the “death” of the Great Barrier Reef began with a joke obituary by Outside Magazine earlier this week, attributing the cause of death to coral bleaching. “The Great Barrier Reef of Australia passed away in 2016 after a long illness. It was 25 million years old,” the author remarked, tongue in cheek. Scientists quickly responded by noting that the Great Barrier Reef was indeed sick, but it was nowhere near death, and that people shouldn’t take the claim at face value — something that a ton of people on social media did anyway. 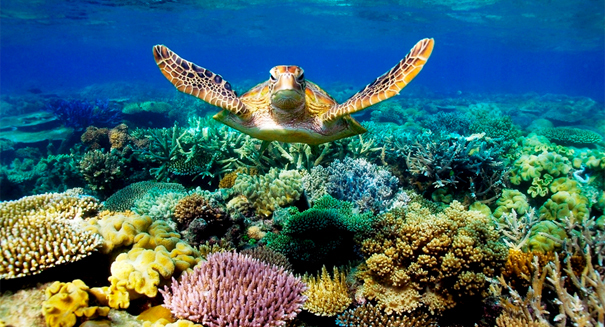 The Great Barrier Reef is the largest coral reef ecosystem in the world and a UNESCO World Heritage site. It spans 300,000 square kilometers. And make no mistake: the Great Barrier Reef is in big trouble, with 93 percent of its reefs affected by bleaching. Bleaching is when extreme changes in temperature or nutrients cause the coral to expel algae, resulting in them turning white.